Wow. I finished this over the weekend, and I am still struggling to find the right words to convey what a massive emotional impact it had on me. 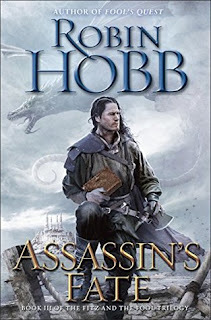 Assassin's Fate is everything I could have asked of Robin Hobb - an entirely satisfying conclusion to not just the story of FitzChivalry Farseer, but that of the entire Realms of the Elderlings and all its interconnected works. This is a book of Farseers, Fools, White Prophets, Liveships, Dragons, are more. It's as if everything that Hobb has ever teased or hinted at before is finally realized here. Not content to merely rip out our hearts, she tears the entire world asunder, ensuring that no corner of the Six Duchies will rise from the ashes of Fitz's final story unchanged. Let there be no mistake, this is a book of endings. Yes, there are new beginnings to be found as well, but Assassin's Fate marks the end of so many characters and storylines that it's easy to miss some of them. I will be honest, it hurt to see Fitz and the Fool at such odds in this series, and that pain only gets deeper here. The closer they get to realizing their thirst for revenge, the more fractured their relationship becomes. He's always known that the Fool lies, holds back, and plays things close to the chest, but it's only here that Fitz feels the true sting of well-meaning deception. What's more, as much as the loss of Bee has already driven a definite wedge between them, the discovery that she may still be alive only serves to splinter that wedge and drive it in deeper. There is a lot of guilt and sorrow here, on both sides, and the way Hobb finally resolves that conflict . . . well, I refuse to spoil it, but I will say it does a beautiful job of bringing the entire story full circle, with a climax that's quietly significant, rather than explosively tragic. In reading this final volume, I find myself gaining a new appreciation for its first installment, a book I was rather hard on at the time. While I still feel Fool's Assassin had some pacing issues, I now understand what Hobb was doing with the characters. It was clear from the start that they had aged, changing drastically in the process, but it's taken three books to understand the how, the why, and the how much. The more we learn about Fitz, the Fool, and Bee . . . the more we understand how their fates intersect . . . the more recognize who they really are . . . the bigger their shared story becomes. I still feel as if Chade was set aside a little too easily, but I loved the way Hobb allowed Queen Kettricken and Thick to slip back into the story, all part of bringing so many things full circle. As for Bee, I resented her in the first book and barely tolerated her in the second, but here she becomes a heroine of note, still hard to like, but easy to admire. Much of this story is a journey, but it's deeper than the waters of the Rain Wilds themselves. There's a dual significance to just about every scene, a story that we read upon the surface, and a story that we feel beneath the waves. I wish I could say more about the Liveships, the Dragons, and their connections to far-off Clerres, but that's something to be discovered in the course of the story. Like I said earlier, hints are exposed and secrets revealed, and done so in such a way that we almost feel as if we should have already guessed at them, yet cannot deny the skill with which Hobb uncovers each one. You don't necessarily need to have read The Liveship Traders Trilogy or The Rain Wilds Chronicles to enjoy this final volume, but you'll certainly miss out on some of the significance. Robin Hobb books take a lot of patience, focus, and thought to appreciate. Her stories are not easy ones, and the emotions they provoke are not always the ones we'd like to take away from an escapist fantasy. Despite the dragons, the prophecies, and the magic of both Skill and Wit, these are human stories, well-grounded in the human experience. As such, Assassin's Fate is the final chapter in a long life, well-lived, a story that many of us have aged with, and while we never want to let go of friends, sometimes it's clear that it's time. Hmm, I shall see if this is on Kindle. I'm looking for a new series to get involved with. I haven't read any series worth addicting too since Terry Goodkind's Sword of Truth series. I need a good fantasy to indulge in. Beautiful review for an emotional finale. Thank you. A beautiful and insightful review. Thank you. I got into this series of books later so didn't have to wait for most of them but I now consider this as the best set of books I've ever read. Hobb is amazing. she knows how to make you smile and feel good and then crushes you into the ground and leaves you weeping. I wanted this book to end differently but this was inescapable. this is a good place to end it and for now I want it to, but maybe in a few years i'll want another set of 3 books set around the next generation of characters and how they shape this beautiful world.